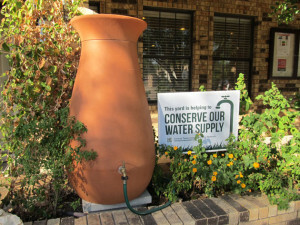 Subdivision Scale Rainwater Harvesting: A Solution for Texas? The drought in the US southwest and west shown so much on the news is expected to get worse over the next several years and specifically in Texas where huge numbers of people are moving to cities like Austin and Dallas. According to Forbes, the Austin area is now the fastest growing city in the US, with Dallas coming in at number 4 and Houston at number 10. Currently, Austin is in stage 2 drought on a 0-4 scale with the lakes that store water for the city being a little above 30% full (Austin draws directly from Lake Austin, but that lake is held at a constant level by releasing water from Lake Travis, which in turn gets water from Lake Buchanan via Inks Lake). With the panhandle and parts of central Texas covered with the color of dark red symbolizing exceptional drought, and expectations that this drought will be extending its stay, new sources of water are being sought after to offset the damages. In Wichita Falls, with a population of 100,000, the conditions have degraded so much that officials predict their water supply will only last 2 more years which has forced the city to consider using a water supply consisting of 50% treated waste water which has got residents buying bottled water instead. With 88% of Texas in some stage of drought, solutions to this problem are vital to the health of Texas, which has inspired a study funded by Texas State University and The Meadows Center for Water and the Environment to the forefront of this problem. 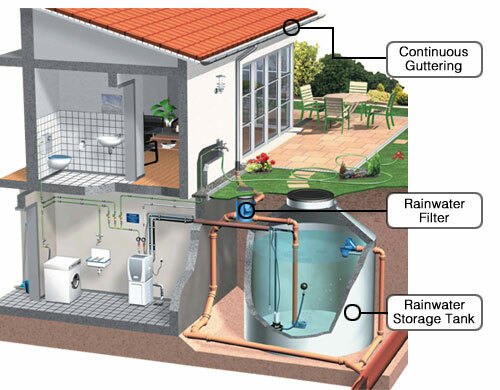 The study explores the possibility of subdivision scale rainwater harvesting systems which would collect the rainwater off the roofs of an entire subdivision to feed the water demands instead of drilling into an existing well that may be already stressed from other residences. The study took place from 2011-2013 in the Hill Country and yielded cost effective results that would overall be beneficial to the developer and residents. If each house was 33ft by 44ft with an average rainfall of 32in per year (Austin’s average) then the house would yield around 30,000 gallons of water per year! In a subdivision with around 400 houses that would add up to 12,000,000 gallons of water per year for a sustainable, high quality water supply. The study compares capital costs of a rainwater harvesting system (RWH), private wells, a community well, building a water system within the development, and a water system that connects to an already existing public system. The capital cost of RWH would be the greatest out of all options, nearly doubling that of a community well or an existing waterline. However, unlike all other options, there would be little upfront costs such as installing pipelines and a water system before a house is even built. The cost would be at the time each house is built which means less investment on the developer on top of also having a cleaner and more sustainable water supply. The study concludes that the decision for or against a RWH system depends on the location of the property and if there is an existing well or connection system that would guarantee long term water supply, the number of houses intended to be built which would be restricted by the available water supply, and the upfront costs that the developer is willing to invest.